Ota Collection contains more than 1,900 volumes related to English studies from traditional grammar to generative grammar by way of structuralism donated by Akira Ota, Professor Emeritus of Sophia University. The library holds a large collection of books and resources on theoretical and applied linguistics. What makes it special is the collection of unpublished PhD dissertations, reprints of unpublished manuscripts on modern linguistics, and microfilms containing out-of-print books on applied linguistics. The major domestic and international journals, series and back issues are also available. ■If someone other than the person above wishes to access the resources, the following two documents must be produced. Not allowed to borrow books; May copy the books inside the library if you produce the letter of request listed above. Ota Collection is a closed stack system. You may only browse and copy inside the research room. 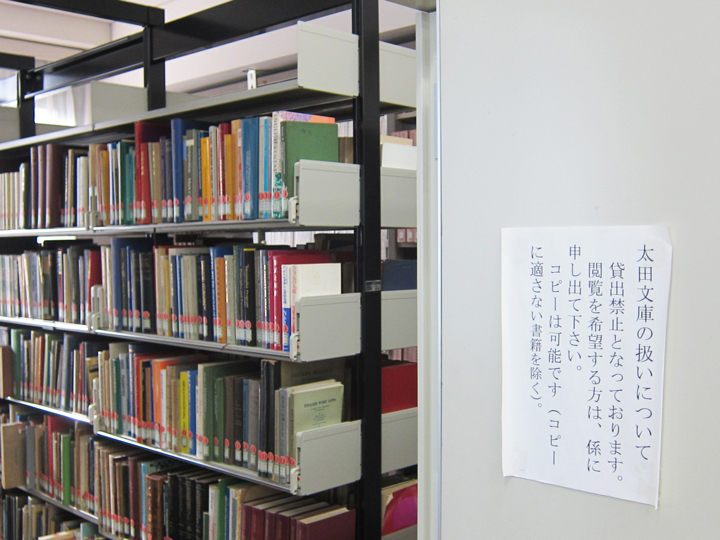 ■The research room will be closed on extended holidays and entrance examination periods. Please contact beforehand when visiting.